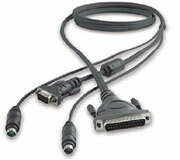 This 1.8 metre cable has an HD15 (VGA) male and two 6mcc male connectors at one end, and an HD15 (VGA) female and two 6mcc male connectors at the other . 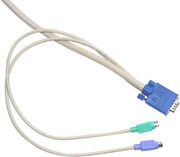 Suitable for connecting a Standard PS2 type computer to a Belkin, Aten or Rextron KVM Switch. This 6 metre cable has an HD15 (VGA) male and two 6mcc male connectors at one end, and an HD15 (VGA) female and two 6mcc male connectors at the other . This 10 metre cable has an HD15 (VGA) male and two 6mcc male connectors at one end, and an HD15 (VGA) female and two 6mcc male connectors at the other . 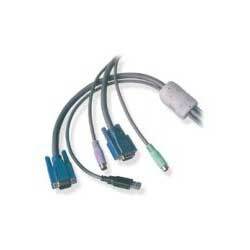 Suitable for connecting a Standard PS2 type computer to an Aten, Rextron or Belkin KVM switch. to connect an Aten Masterview, Belkin Omnicube or Omniview KVM switch to a PS2 style computer (with 6 pin mini circular keyboard and mouse and HD15 video ports). to connect anAten Masterview, Belkin Omnicube or Omniview KVM switch to an 'AT' style computer (with 5 pin Din keyboard, 6 pin mini circular mouse and HD15 video ports). Allows you to connect a PS/2 KVM switch to a PC with USB only ports. To use this cable, The KVM Switch should be externally powered. Belkin OmniView SOHO Series with Audio KVM Cables allow you to connect all your USB/DVI computers, speakers, and microphones to your SOHO Series KVM Switch. Each provides high-performance connections with all the cabling necessary for complete installation of an OmniView SOHO Series KVM Switch. A fully moulded cable consisting of a USB A-B connection and a HD15 M-F connection for connecting a Belkin or Rextron USB switch to your PC. 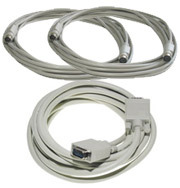 A cable kit for connecting your Belkin or Rextron USB switch to your PC. Includes 1 x 2m A-B USB Cable and 1 x 2m HD15M-F SVGA Cable. 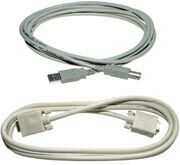 Includes 1 x 3m A-B USB Cable and 1 x 3m HD15M-F SVGA Cable. Includes 1 x 5m A-B USB Cable and 1 x 5m HD15M-F SVGA Cable. Belkin OmniView MATRIX Series Cables provide connectivity between your PS/2 servers and OmniView MATRIX2 KVM Switches. 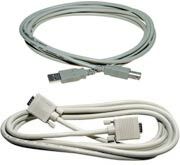 This generic 2 metre Daisy-Chain Cable is used to link multiple Belkin OmniViews together in a daisy-chain configuration. This OmniView MATRIX Series Daisy-Chain Cable lets you daisy-chain multiple MATRIX2 Series KVM Switches 1.5 metre (5 foot) apart to expand the size of your KVM configuration. 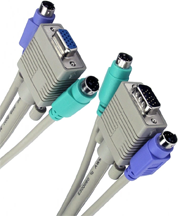 Made of premium wires and coaxial VGA lines, these cables preserve signal integrity from the first to the last computer.